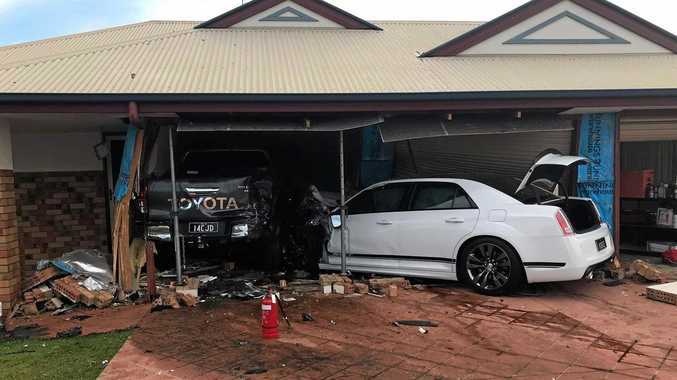 A MORANBAH father has described the moment he woke to find his family in tears and a car smashed through their lounge room wall. On the morning of October 13 last year, Joseph Albert William Hodges, 34, crashed his white Chrysler into Cory Douglas's Clements St property. Mr Douglas said he had been sleeping for day shift at the time and woke to a "horrific sound" before running out to find his family in tears and part of the house "in rubble". "Then (I realised) he only narrowly missed my family, as they were a metre away to where he pushed my car from our driveway through the garage and into the wall of my lounge room," Mr Douglas said. The details of how Hodges came to be at the house with the American blue staffordshire terrier he had taken from his children's babysitter were complicated, the Mackay Magistrates Court heard. "He has gone and pinched the dog and on his way home he was going a bit fast and (has) run into someone's garage." Prosecutor Brandon Selic said the situation had arisen because of an arrangement between the defendant and the family's babysitter. The two had agreed she would be remunerated for her child minding services with an American blue staffordshire puppy from a litter that Hodges and his de-facto partner had for sale, Mr Selic said. In court last Wednesday, Hodges pleaded guilty to one count each of stealing (the dog) and dangerous operation of a vehicle while adversely affected by an intoxicating substance. 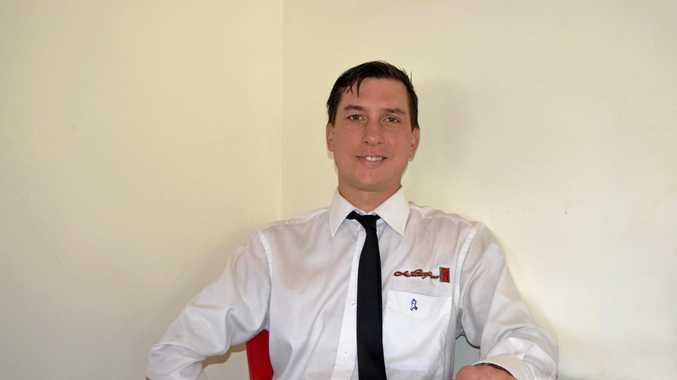 Mr Selic said Hodges' driving was described by witnesses as "concerning" and "erratic". Magistrate Dwyer said in sentencing: "The most important factor to me is that he gets back to work and start paying off the debt to that person. "You have caused significant damage to those people and you owe them an awful lot of money." Hodges was fined $3000 and disqualified from holding a licence for six months. Mr Douglas said to this point, no formal financial arrangements had been made between his family and Hodges. "There has been no mention of any compensation for our family," he said. "For our home and cars, the bill has been approximately $150,000." Mr Douglas said he did not feel that Hodges's sentence was adequate. "With all these charges and damages combined, I believe he should at least be looking at a period of time in jail. "Although none of us were physically hurt during the accident, it's been very traumatic for our family. "It's been a very stressful process... so we will be very relieved when our home is fixed. "We still jump when a loud car drives by and our children get frightened whenever they hear any sudden loud noises."